I must have got too used to sleeping in the tent as I did not sleep all that well in the hostel, the bed was so so and the beddings a bit too heavy. I was sharing the room with half of the European Union (a boy from Spain, a girl from Germany and one from from the Netherland). Together with other two german girls in a different dorm room, this was all the inhabitants of the hostel. They were all very nice and we spent the evening telling each other about our lives and experiences of New Zealand while discussing a topic that seems to come up a lot talking with people on the road: the difficulty of reentry. People that have not left their homeland, or at least that have not left it with their head, cannot understand, but all those that have done so know how difficult it is to go back. When you go back, the people you leave behind are, often, more or less how you left them, and worse, expect you to be more or less how you were before you left. You however have often changed beyond recognition as a result of both environmental and human interaction you’ve had. This creates a wall of non comprehension which results in dissatisfaction on both parts. One of the girls last night said that she was going to try and meet up with all the people she had met in the 2 years she has been away in order to soften the landing. 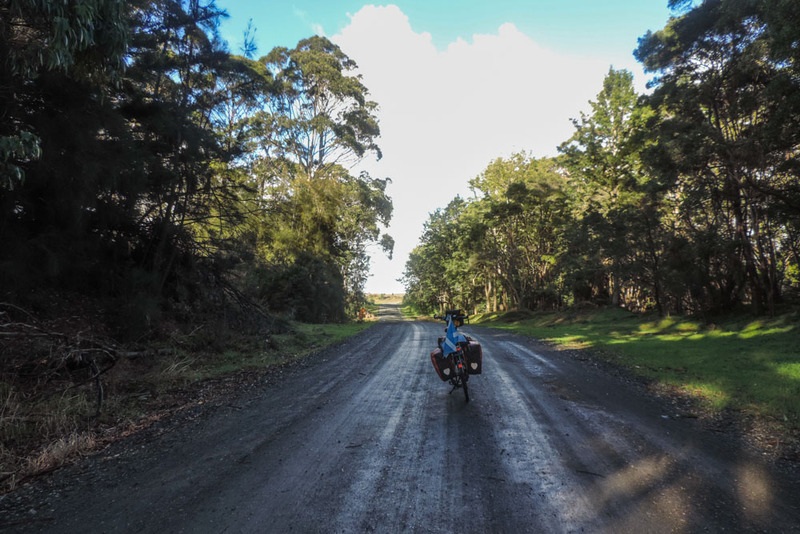 Back on the forestry roads, it seams that unsealed roads are the norm at the extreme north and extreme south of the country. The plan for today was to go towards the west coast and see 90 Miles Beach. 90 Miles Beach is a very long beach in the north west coast of New Zealand. Despite the name the beach is not 90 miles long, it is in fact 54.7 miles, however, when you’re on it, it truly gives the impression of going on forever. From the Hostel it was approximately 8 miles before I hit the beach. Not dull miles, peppered as they were with fairly strong showers that reminded that we’re now coming into the thick of autumn. Just after one of these showers, as I was intent in taking pictures to post on Facebook, I got overtaken by a beeping car which turned out to be the two german girls from the other room, they were going in the same direction as I was, albeit an awful lot faster. And then I got to the beach. The trick was to find the bit of sand that was not too wet and not too dry. As both wet and dry mean sinking. 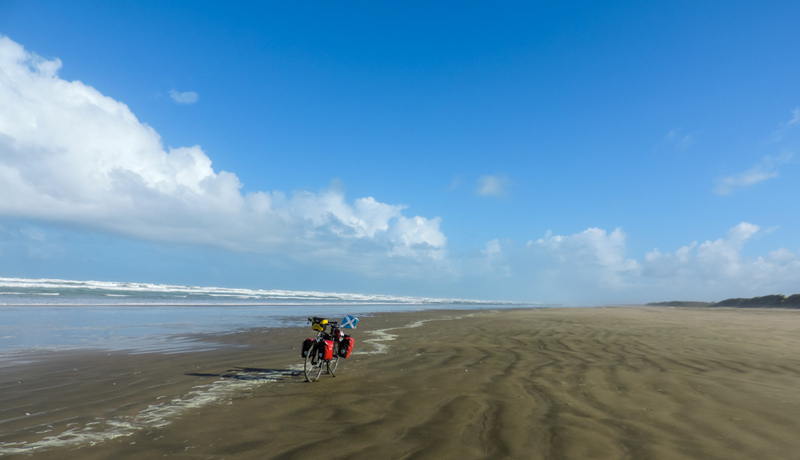 While I researched this stage I had banked on riding the “Coast Road” which runs parallel to the beach, just behind the dunes for approximately 9 miles to the 90 Miles Holiday Park. I had however read that it was possible to ride on the beach at low tide and I was hoping to do just that. 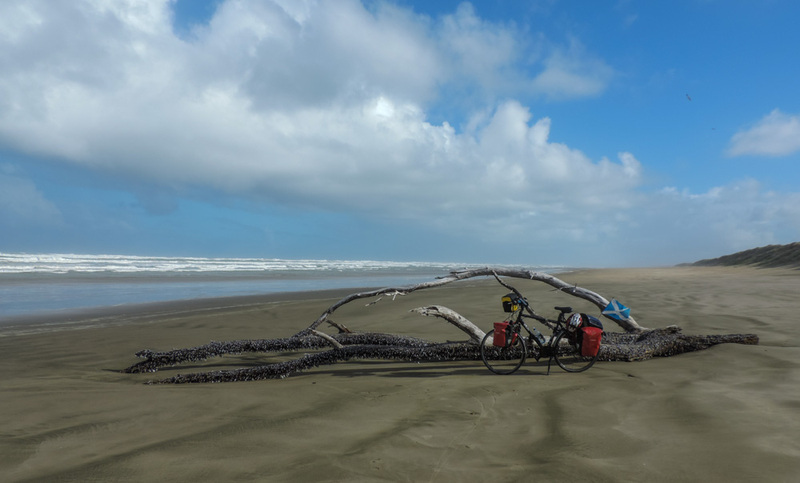 I knew that it was possible as I already rode on the beach at the Moeraki boulders, I just needed to check it was going to be ok here too. Getting to the beach where I did I also had the additional advantage of having the coast road as a backup, in case riding on the beach had become too taxing. With that in mind I started riding south. Occasional driftwood, not quite as much as I expected given the experience of other coasts. 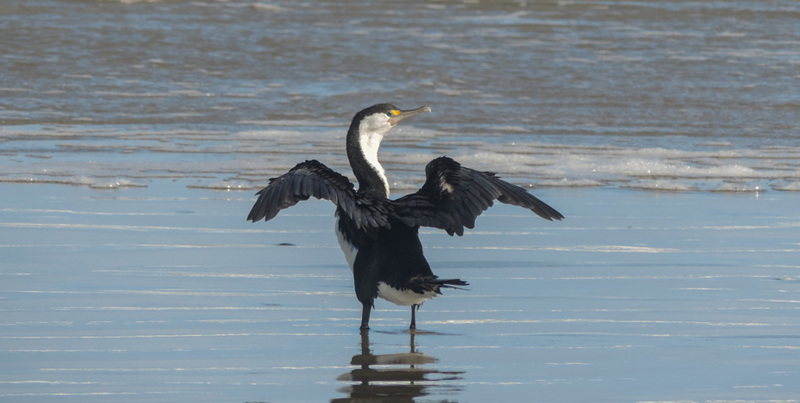 Only company were the birds and, in 20 miles, 3 transporter busses with tourist doing the sand tour. 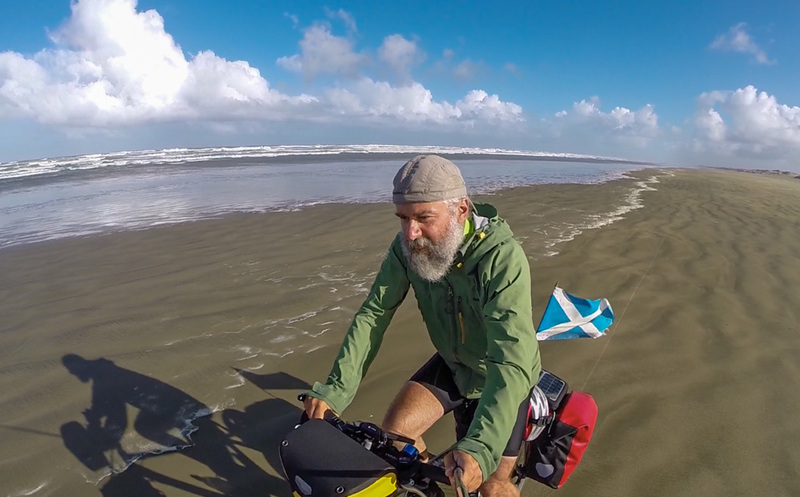 Riding on wt sand is an interesting experience, while you are moving all is well, but if you stop you realise that you start sinking. When I say sinking you should not visualise quick sands, more like a gentle slow descent that prevents you from leaving the bicycle on the stand long enough to take pictures. I learned quickly that it was possible to achieve stability by widening the surface of the stand and for that there were plenty of large shells that could be used. Sometime I forget how the GoPro can be useful to capture pictures that would be pretty difficult without. After eight or nine miles of cycling I got to the Holiday Park. This was not my destination but it was the point where the coast road ended. In the past few miles I had been in two minds on the merit of continuing on the beach versus resuming a road route. If I continued on the beach and something happened, let say I encountered a river estuary in front of me, there was not going to be a fall back option other than turning around and going back. On the other hand if I was to continue on the beach, as well as the better riding experience I was going to cut 10 miles off the day’s work. I thought about it and I elected to continue. In the end I did encounter a couple of water obstacles but they were shallow enough for me to ride through. On the whole I admit it was rather interesting. There were stretches of the beach where there was nothing as far as the eye could see and, while I knew that civilisation was only a maximum of 3 hours walk in any direction I could not help feeling a little bit on a different planet.